When I stepped onto the clay court for the week’s first official match—yes, Newk let me live the clay dream—at 9 am, the wind was a steady 30 mph, with stronger gusts. 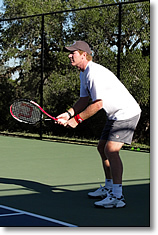 Across the net, my opponent—the Wankers’ Jim Hamilton, a CPA from Chapel Hill, NC—stood with his coach. Hamilton would not have been my first choice to play against; eight years younger, nine inches taller, and, as we warmed up, clearly as fit if not fitter. His coach stood back against the fence, inside the court, still watching. Occasionally, he would whisper advice to Hamilton, between our practice rallies. That was disconcerting enough. The fact that Hamilton’s coach was Roy Emerson—yup, the 12 Grand Slam singles, 16 Grand Slam men’s doubles titles Emmo—and the fact that he was actually studying my game to figure out how to beat me was both thrilling and a nightmare (which I guess is another word for fantasy). I mean, my hitting partner Andre Heimann can tell you in 30 seconds or less how to beat me. 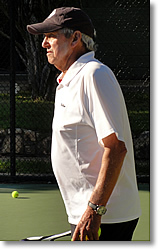 And here was Emmo, arguably one of the greatest payers and coaches in history, on the court, strategizing and coaching. Against me. I have to say, that wasn’t part of my particular fantasy. I just don’t know why it took him nearly 15 minutes. Needless to say, it worked pretty well for Jim, who locked up a 6-4, 6-4 win by rolling me in the last three games. By then, Emmo had moved on, working his magic on several of the other 14 courts where singles play continued. His touch proved as sure as ever—the Wankers took an 11-3 lead into the afternoon doubles. My teammates Hutch and Rich and I commiserated. 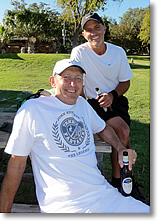 Rich Flicher, a lawyer and businessman from Los Angeles and like Hutch and me a rookie, in fact had been an inspirational bright spot, gutting out his singles victory with a super-tiebreaker win where he came to the net every point. Last night, at the bar after dinner in another “peel the layers of the onion” moment, Rich had told Hutch and me that he was a cancer survivor, that he’d been diagnosed—in his 20s—with a lymphoma that had moved aggressively from above his neck down into his torso. Then he’d lifted his shirt to show two long scars, one horizontal across his upper chest, the other vertical and just above his abdomen. The surgery, the accompanying chemo, and his determination and mental toughness had pulled him through. So Hutch and I, as we told Rich, weren’t surprised when a little Texas breeze hadn’t distracted him, just proud. My mood really picked up when Mark Woodforde told me that I’d be playing doubles with Rich, and that Hutch—Don Hutchison, a realtor from Reading, Pennsylvania who is about to turn 60 and gave himself the Fantasy Week as a milestone birthday gift—would be on the adjacent court with Tom, another solid player. The optimism was rewarded when Hutch and Tom won in two tight sets, and Rich carried me through another super-tiebreaker, as we reeled off the last six points to win 6-4, 1-6, 10-4. This gratifying sense of knowing that one belonged was echoed in the evening conversation. All the Legends talked about their Wimbledon experiences, and for many it was the moment they were scheduled to play on Centre Court for the first time. Woodforde, who’d admitted at our dinner table that he’d always thought of himself as a singles player and had trained and practiced that way, described a match with Ivan Lendl, when Mark was ranked no higher than 60 or 70, and Lendl was either the first or second seed in the tournament. They’d met in the fourth round, but Mark was on the show court now. He gave Lendl all the Czech wanted, Woodie recalled, and nearly beat him. And he knew he’d found his place. Woodie eventually rose to 19th in the world in singles, and there’s nothing shabby about that. But he’ll always be remembered by tennis historians as a doubles master. Yet, on this night in a ranchhouse dining room in southeast Texas, he chose to focus on a fourth-round singles match that he’d lost, that the world had paid little attention to at the time, and mostly forgotten about since. It’s amazing what we carry with us through the years. Two other notes: during an afternoon serving clinic, I wandered over to where Emmo was running a drill and, to my astonishment, discovered he was using the Wilson K Zero I play with—a ridiculously light, oversized-head piece of equipment I’ve never seen anyone else pull out of a bag. Truly, Emmo is a god who walks among men. As he took a sip of his drink, I thought about our day. We’d worked hard. We were ready. I found Hutch and Rich, and we had a drink. Maybe more.